Our thanks to Mr John Rotondi, who serves as an instituted acolyte at the Mater Ecclesiae Mission in Berlin, New Jersey, for sending us this article. The Epiphany of Our Lord is the central feast of the Incarnation cycle, which runs from the First Sunday of Advent to Candlemas. Epiphany is not the end, but the apex of this cycle; it brings to full fruition the expectation of Advent’s “Veni, Domine.” Epiphany fulfills Christmas; Our Lord was born in the stillness of the night and manifested His birth only to a few; the Epiphany recounts Our Lord manifesting Himself, human and divine, to the whole world, from which point, His salvific mission begins. Epiphany brings to fruition the gradual unfolding of the manifestation of Jesus Christ, the eternal Word of the Father, as God made man. The word Epiphany itself is a Greek word meaning “manifestation”; the Eastern Churches call the feast Theophany, meaning the manifestation or appearance of God. St. Paul writes to Titus (2, 11) in a passage often repeated during this season, “The grace of the saving God has appeared (‘epephane’ in Greek) to all men.” At His Nativity, the Word made flesh is manifested to the Holy Family, to shepherds, to lowly beasts of burden. At His Circumcision on the eighth day, the Word Incarnate is given the name Jesus in the temple, and He sheds His first drops of blood for our redemption. And now, He is fully revealed to the world in three ways which this feast of Epiphany celebrates simultaneously: His adoration by pagan wise men from the East; His baptism in the Jordan, at which His divinity and the Triune God are revealed, and the mission of St John the Baptist, which dominated the liturgy in Advent, is fulfilled; and His first miracle, the changing of water into wine at the wedding feast at Cana. As such, Epiphany is one of the four principle feasts of the year, along with Christmas, Easter and Pentecost, traditionally preceded by a privileged and special vigil. (By vigil, we refer to an entire day of preparation before a major feast, not a Mass of the feast itself anticipated the evening before.) Considering the importance of the feast, it is a very strange and unfortunate phenomenon that its ancient vigil, along with its highly privileged octave, was suppressed in 1955, along with many other things. Hence, in the 1962 Roman Calendar, there is no longer a “Vigil of Epiphany,” and January 5 was recast as a generic Christmas feria. 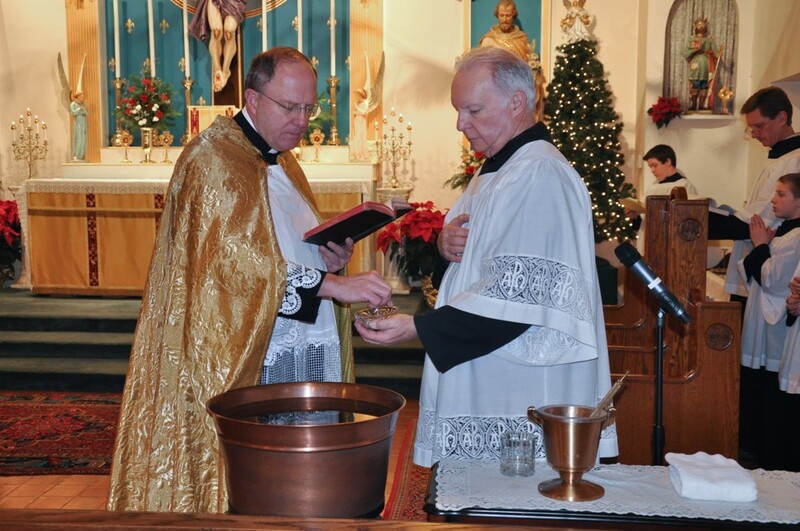 This post will describe the Roman Liturgy of Epiphany Eve as it existed prior to that time. This Vigil is not like that of Christmas, a day of penance. The Child, whose coming we were then awaiting, in the fervor of our humble desires, is now among us, preparing to bestow fresh favors upon us. This eve of tomorrow’s Solemnity is a day of joy, like those that have preceded it; and therefore, we do not fast, nor does the Church put on the vestments of mourning, even in those churches where the Octave Day of St. Thomas of Canterbury is not observed. If the Office of the Vigil be the one of today, the color used is white. This is the twelfth day since the Birth of our Emmanuel. If the Vigil of the Epiphany fall on a Sunday, it shares, with Christmas Eve, the privilege of not being anticipated, as all other Vigils are, on the Saturday: it is kept on the Sunday, has all the privileges of a Sunday, and the Mass is that of the Sunday within the Octave of Christmas Day. Let us, therefore, celebrate this Vigil in great joy of heart, and prepare our souls for tomorrow’s graces. As a festal Office, that of the Epiphany Vigil begins with First Vespers on the evening of January 4. The antiphons and psalms, as well as the chapter, hymn, verse, and Magnificat antiphon are taken from the feast of the Circumcision; the collect, however, is that from the Sunday within the Octave of Christmas. Compline is the same this evening of January 4 as it has been during the Christmas season thus far. Matins and Lauds are also largely taken from the feast of the Circumcision. The lessons of the first nocturne continue the Epistle to the Romans begun on December 29; those of the second are taken from a Christmas sermon of (pseudo-)St Augustine in which he, like Dom Guéranger, refers to the fulfilment of the “Rorate caeli” of Advent. Those of the third nocturne are taken from St Jerome’s treatise on the Gospel of the Vigil’s Mass (noted further below); the Te Deum is sung as on feasts. Lauds are also repeated from the Circumcision, with the Collect of Sunday. Prime and Terce follow at their usual times; the Mass of the Vigil is celebrated after Terce, rather than after None, as is the case with the other three major vigils. The Mass Propers are taken from the Sunday within the Octave of Christmas – i.e. the Introit Dum medium, etc. The Gloria in excelsis is sung. After the Collect there are two commemorations, the first of St Telesphorus, Pope and Martyr, the second of the Virgin Mary. The Epistle is repeated from the Sunday within the Octave, but the Gospel today is proper, St Matthew 2, 19-23, which recounts the death of Herod and the return of the Holy Family from Egypt to Nazareth, the continuation of the previous day’s Gospel on the Octave of the Holy Innocents. (This Gospel passage does not appear in the 1962 Missal.) The Credo is sung by special rubric for this vigil. The Preface is of the Nativity, the last time it is sung this season, but the proper Communicantes of Christmas is not said. Sext and None are sung in the afternoon at their usual times, after which, the Vigil of the Epiphany comes to an end; there is no color change to mark the transition, since white is used for both vigil and feast. The feast of the Epiphany then begins with First Vespers, at which is sung the Magnificat antiphon “The Magi seeing the star, said to themselves: this is the sign of the great King; let us go and seek after Him, and let us offer him gifts, gold, frankincense, and myrrh, alleluia.” The Roman Liturgy will continue to emphasize the Magi and their gifts in the texts of the Epiphany, though again, we celebrate three manifestations. The most noteworthy aspect of the Liturgy on Epiphany Eve is the solemn blessing of water given in the Roman Ritual for this evening, an ancient eastern tradition borrowed in recent centuries by the West. The significance of this ceremony cannot be understated; Easter and Pentecost, the only two feasts of the year more important than Epiphany, are both preceded by solemn baptismal vigil rites. The Epiphany Water, however, is not baptismal water, but evokes the same theme of baptismal cleansing; this ceremony connects us to the second (and arguably the most important of the three) manifestations we celebrate, the Baptism of Our Lord in the Jordan. Hence, Easter, Pentecost, and Epiphany are all preceded by vesperal, baptismal-themed rites. This ceremony has had two iterations in the West. The first was observed before 1892 and was much more elaborate, mimicking, to a large extent, a Matins’ service. The older ceremony also has many parallels to the Paschal Vigil on Holy Saturday, notably in the inclusion of sung Prophecies. The second iteration is a scaled down rite and came to be codified in the Roman Ritual after 1892; this will be discussed in further detail. Since it was never incorporated into the Roman Missal as a vigil ritual like that of Holy Saturday, the blessing of water on Epiphany Eve has always been optional in the West, and unfortunately, it has almost always been practiced sporadically, and increasingly less often during the twentieth century. There was even a time in the interwar years (i.e. 1920-1940) when some high-ranking ecclesiastics actively tried to suppress it as “too Eastern” . (The anti-liturgical heresy, as Dom Guéranger called it, will always be with us!) In more recent years, it is enjoying a small renaissance among a few tradition-minded parishes. The post-1892 Epiphany Water ceremony begins with a penitential act: the Litany of the Saints is sung kneeling, and two additional invocations are added to bless the water. Three psalms, 28, 45, and 146 are then sung, the verses alternated in the usual manner by the two sides of the choir. Next, the celebrant pronounces a solemn exorcism over the water, as in many other such blessings. Then the antiphon “Hodie caelesti Sponso” is sung with the Magnificat (or Benedictus if the ceremony is performed in the morning): “Today the church is joined to her heavenly Spouse, for Christ washed her offenses in the Jordan: the Magi hurried with gifts to the heavenly wedding-feast, and from water being made wine, the wedding-feast is made gladsome, alleluia.” This antiphon, recounting the triple manifestation we celebrate, is also the Benedictus antiphon sung at Lauds on the morning of Epiphany and again on its Octave Day. Following the Gospel Canticle, the water blessing proper takes place: exorcism of salt and the confection and blessing of the water. All present are then sprinkled with the blessed water, and the ceremony finally concludes with the hymn of thanksgiving, the Te Deum.